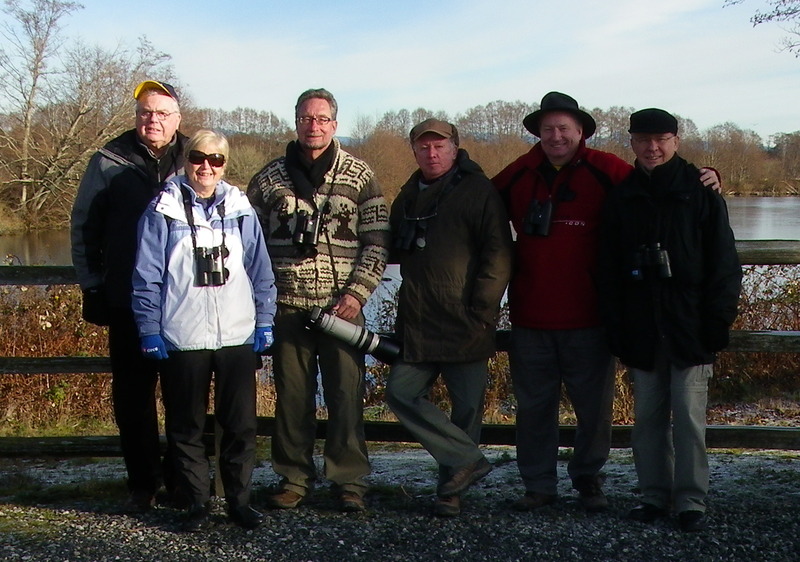 Six DNCBer’s (Mike, Roger, Hans, Anne M, Terry and me) enjoyed a beautiful, sunny Monday morning of birding at the Tsawwassen Ferry Port and then at Reifel Bird Sanctuary. 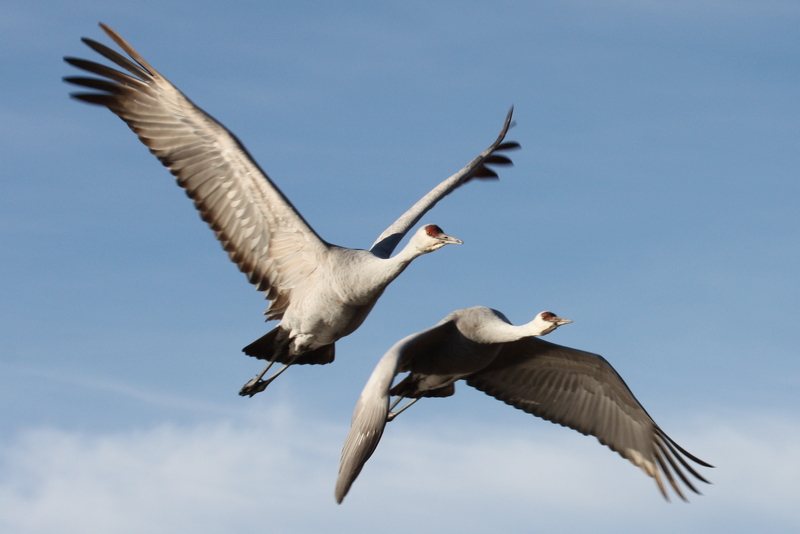 Hi-lites were: sunrise looks at hundreds of waterfowl in the Bay at the Ferry Terminal, two Tundra Swans among a flock of 50+ Trumpeters, feeding the resident and the wild Sandhill Cranes from my hand, and the pizza and beer at the Landing Pub in Ladner. 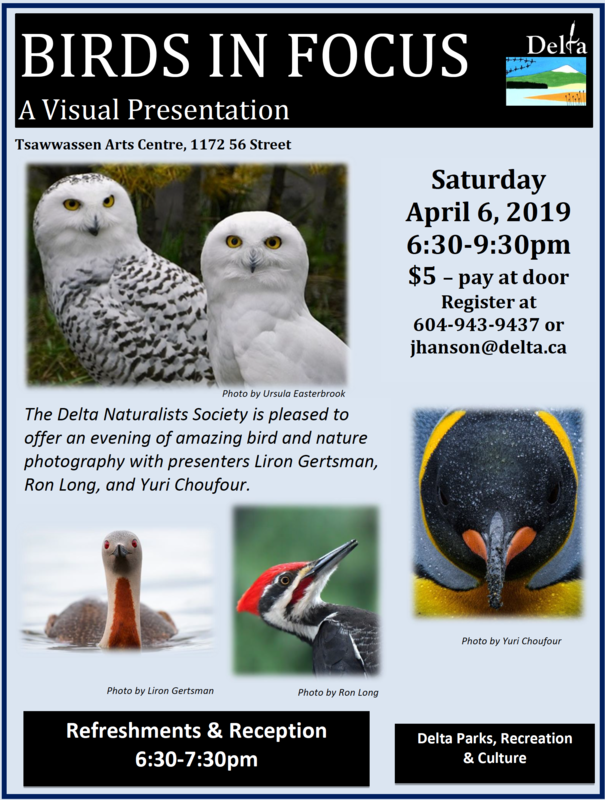 Should be some interesting photos, including the mandatory Group Shot, by Terry and Roger on our Picasa site soon at: http://picasaweb.google.com/dncbirding. We left Petra’s shortly after 8:00 a.m. and stopped at the pull-off area just before the toll booths at the Tsawwassen Ferry Port. It was high tide and there were a few Western and Horned Grebes along the shore. Large rafts of American Wigeon and Mallards in the Bay with some Northern Pintail, Green-winged Teal, Bufflehead, Common Loons and Common Goldeneye cruising with them. Several Black Oystercatchers also flew past and a couple of small swarms of Dunlin were hanging around, occasionally leaving their resting spot on the spit. 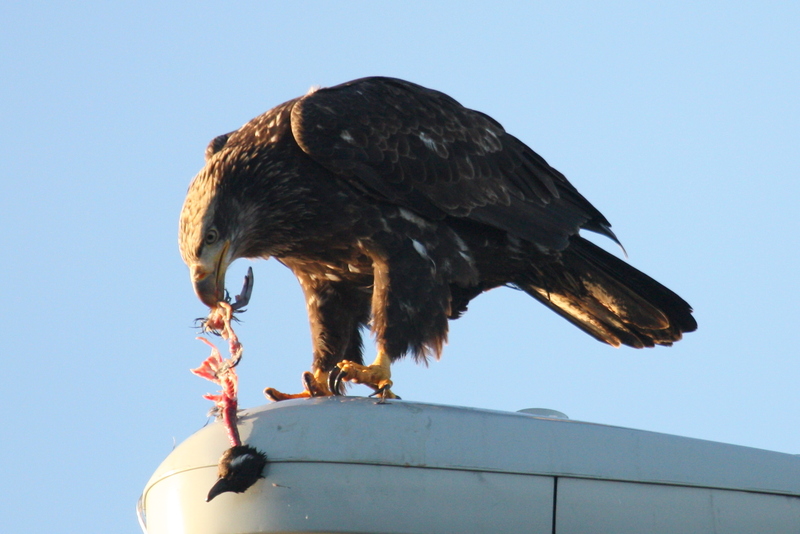 Bald Eagles constantly raised the ducks and we watched one juvenile dine on a female Bufflehead on a lamp post just above us. 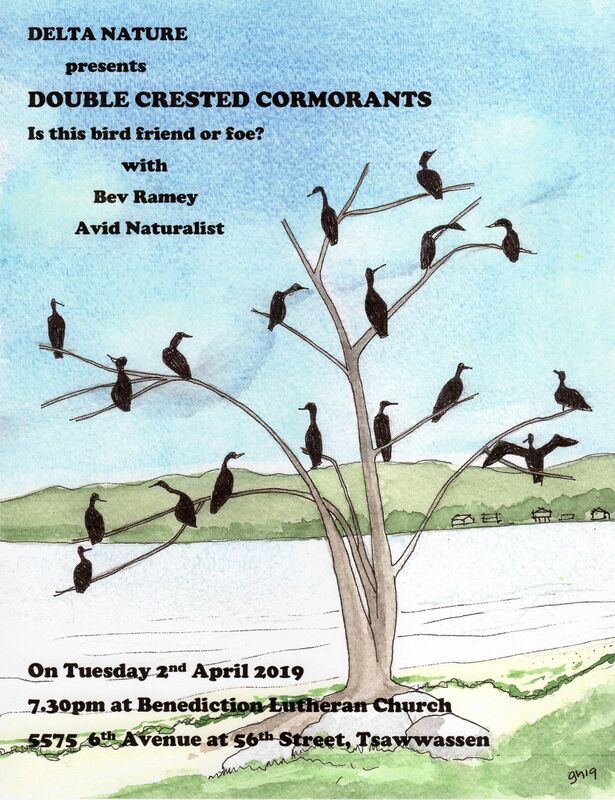 Lots of Double-crested Cormorants around too; one entertained us with its 10 minute antics trying to swallow a large Flounder. The drive to Reifel was uneventful, until a Port Security Guard gave me static for stopping in the middle of the road near the Container Port entrance. We were looking, in vain, for the Gyrfalcon that was seen there yesterday. 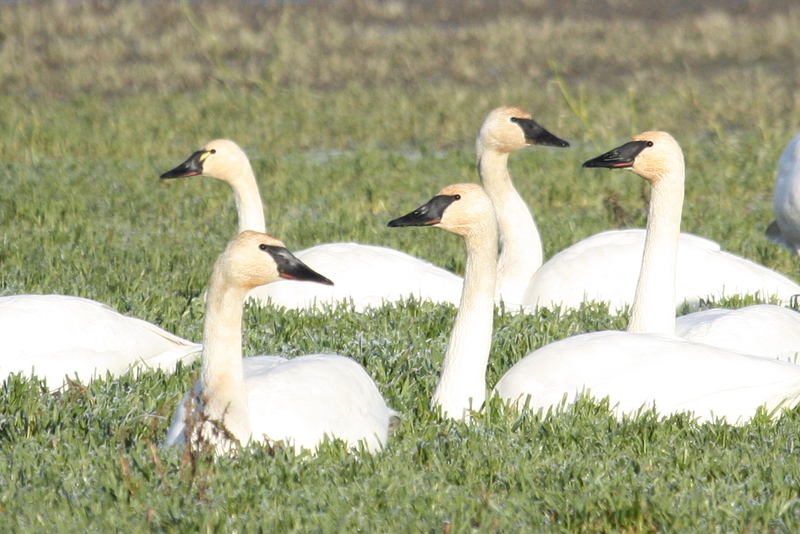 We continued on and stopped by a field of Trumpeter Swans. 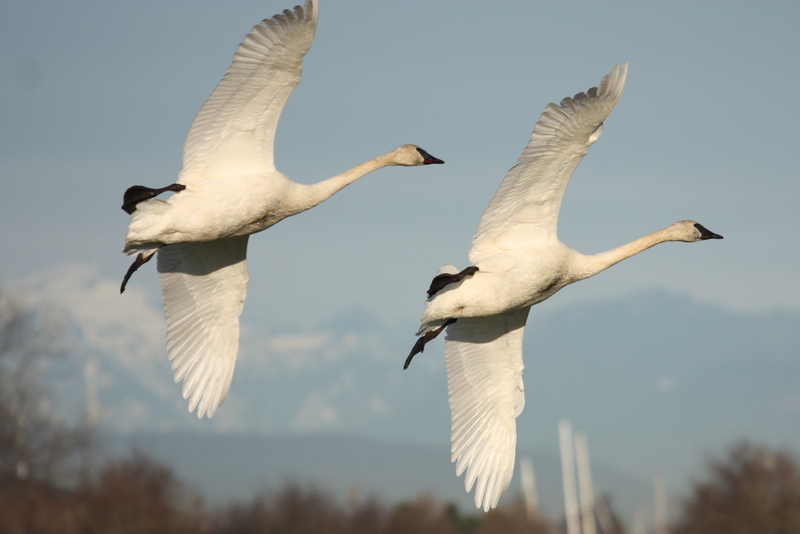 Among the 40+ birds were two Tundra Swans which we studied ad nauseam, noting the differences and similarities. At Reifel there were 5 Lesser Scaup in the bit of open water behind the Welcome Centre. Although it seemed quite mild, most ponds at Reifel were frozen so fewer ducks in the reserve. Three resident Black-crowned Night Herons were there and the regular four Sparrow species (Song, Fox, Golden- and White-crowned) were hanging around feeders. 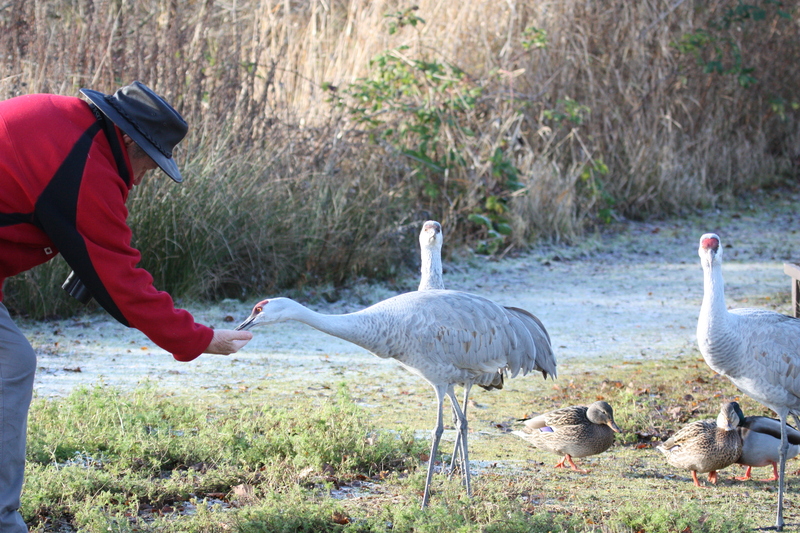 The resident male Sandhill Crane ate peanuts from my hand; later on at the Tower, one of four visitor Sandhill Cranes also ate from my hand (unexpected but neat stuff). From the Tower, we could see skiers on Cypress Mountain, but focused more on the thousands of Snow Geese in the marsh and just off shore. A few Cranes gave us a brilliant fly-past as a lone uninterested Red-tailed Hawk perched in a tree beside us. 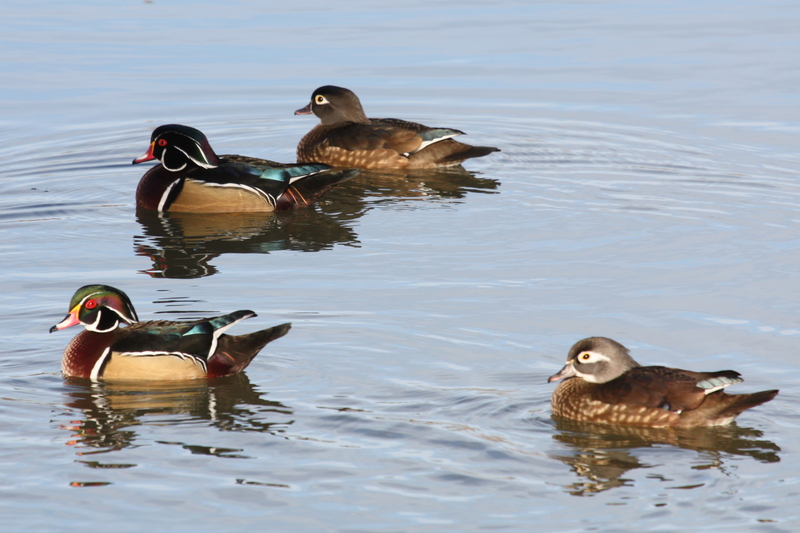 In another bit of open water along the west dike, 4 pair of gorgeous Wood Ducks along with a pair of Hooded Mergansers graciously posed in the sun for us. 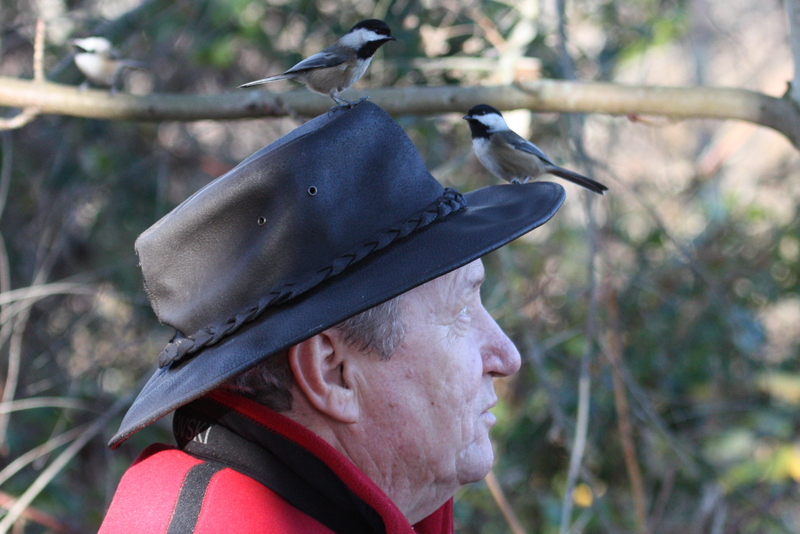 The Black-capped Chickadees were particularly hungry and friendly this morning, eating sunflower seeds from my hand, and off my hat (I love to entertain the photogs). Although we saw lots of other “regular” stuff too, it was not a banner day for neat species, but very enjoyable nonetheless. Since my peanuts were the only sustenance for the morning, Roger, Mike and I decided to lunch at the Landing Pub in Ladner. The beer and “weird name” Pizza were awesome, so the inane conversation did not bother me a bit. Tonight, Cammidge House was packed as the Delta Nats Society celebrated Christmas (lots of wine and home-made goodies) and then Vancouver Aquarium’s Danny Kent gave a fascinating and engaging presentation on Arctic Marine Life. 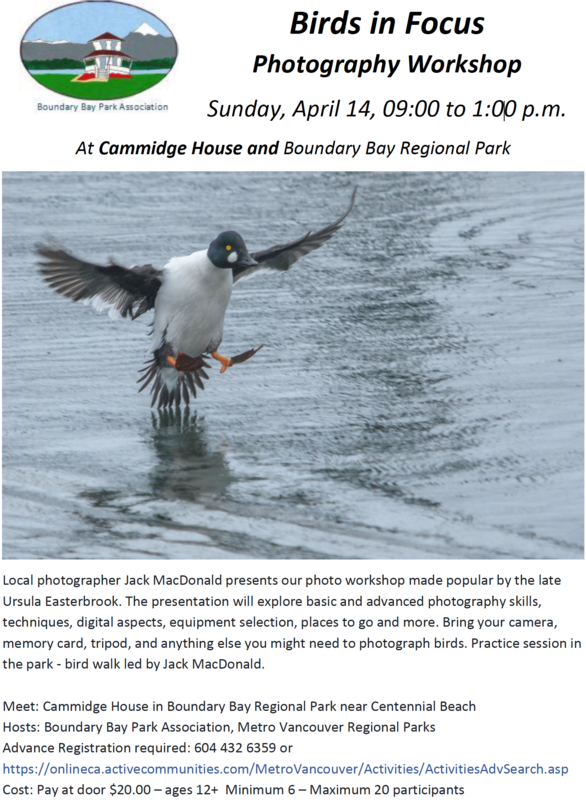 This Wednesday, December 14, we have our quarterly Birds on the Bay outing at Boundary Bay Regional Park, leaving from Cammidge House at 9:00 a.m. followed with goodies prepared by the Delta Nats Ladies. 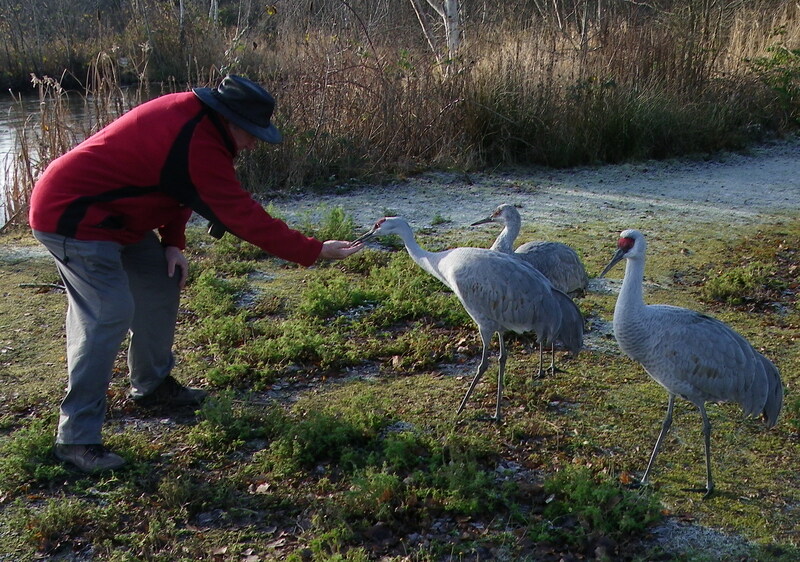 Don’t forget the Christmas Bird Counts, Vancouver’s on Dec. 18 and our Ladner CBC on Tuesday, December 27. Next scheduled DNCB will be Monday, December 19 leaving Petra’s at 8:00 a.m. It’s 2:00 a.m. and I’m tired of writing this crap. If you feel the same about reading it, let me know and I will take you off the list. Meanwhile, comments encouraged and check out our DNCB Blog (https://dncb.wordpress.com/) for other reports and photos. This entry was posted in *DNCB, Cammidge House, Reifel, Tsawwassen Ferry Port, Westham Island. Bookmark the permalink.